Minister for Health, Simon Harris TD officially launched the Donegal Medical Academy, an NUI Galway partnership with Saolta University Health Care Group and Letterkenny University Hospital for the training of doctors. The Academy is housed in a purpose-designed facility located on the grounds of Letterkenny University Hospital with Mr Muyiwa Aremu, Dean of Medical Academy Galway and Philipaa Eaton, Student. Minister for Health, Simon Harris TD today (12 December 2016) officially launched the Donegal Medical Academy, an NUI Galway partnership with Saolta University Health Care Group and Letterkenny University Hospital for the training of doctors. 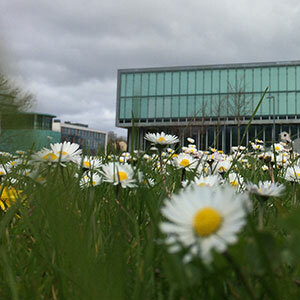 The Academy is housed in a purpose-designed facility located on the grounds of Letterkenny University Hospital. This is a major investment by NUI Galway into clinical training in Donegal, the final in a series of medical academies in the West/North West region. Construction of similar facilities at Sligo and Mayo University Hospitals were completed and opened last year. The new Donegal Medical Academy will allow doctors of the future to fine tune their clinical skills under the watchful eyes of tutors and lecturers covering all medical specialties. Up to 60 students per semester from third, fourth and final medical years rotate through Letterkenny University Hospital for one year clinical training. The co-location of the Academy with the hospital is deliberate as it allows students to attend didactic teaching in the Academy and also bedside teaching in the hospital. 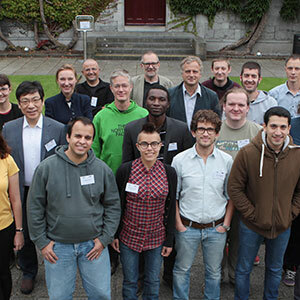 One of the strengths of the NUI Galway Medical academies is the ratio of both tutors to students and also of students to patients. Letterkenny University Hospital provides students with clinical experience and supervision in a wide variety of general medical and surgical clinical disciplines and sub-specialities. Since January 2016, the Donegal Medical Academy has also been welcoming students as part of the School’s new Junior Internship programme which focuses on preparedness for clinical practice and professionalism and is supported by an intern mentoring programme. The School of Medicine supports the development of its graduates to a level of excellence in preparedness for internship and clinical life, equipping them with a complex skill set to perform as competent clinicians, academics, leaders and educators in a changing, complex and demanding working environment. Final year medical students will from January be working on the wards as part of a clinical team and functioning as junior interns, fully supported yet immersed in team working and decision making. They will be supported by supervising consultants and will work closely with interns to learn about the clinical environment first hand and to ease their transition from student to junior doctor. 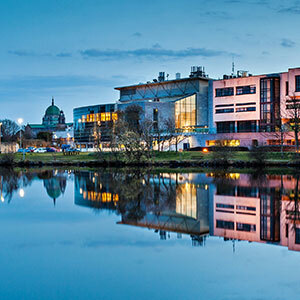 The medical curriculum at NUI Galway is a five or six year programme with an annual intake of approximately 180 students. The curriculum is innovative and integrates the life sciences with clinical practice, provides for early patient exposure, immersion in a variety of clinical environments and, from the 2015/16 academic year onwards, will also be emphasising intern preparedness to a greater extent. 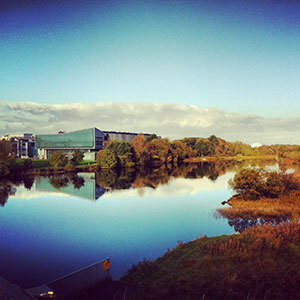 Donegal Medical Academy is sited within the boundaries of Letterkenny University Hospital. The building, forms an integrated yet defined extension to the existing Hospital and is strategically located adjacent to the main healthcare campus entrance. The project has delivered a multipurpose teaching, study and learning facility and the co-location of the Academy with the hospital facilitates allows students to attend didactic teaching in the Academy and also bedside teaching in the hospital. Delivered through close collaboration with the HSE, the project began in March of 2015 and was completed in January 2016. Designed by Rhatigan Architects, in Sligo with the work undertaken by the local construction firm of Boyle Construction. The project represents a major investment by NUI Galway into clinical training and was funded at a cost in the region of €2 million. The HSE has also funded the second floor of the building which will be fitted out at a later date to accommodate an expansion of the Renal Dialysis facilities. 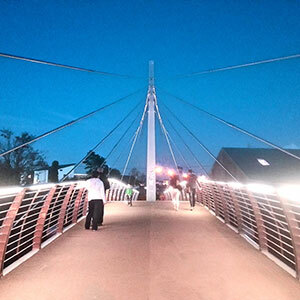 The final result comprises a stunning and innovative architectural design. The building encompasses many features that facilitate a flexible approach to teaching and the various spaces within the building are designed to accommodate different student group sizes simultaneously. 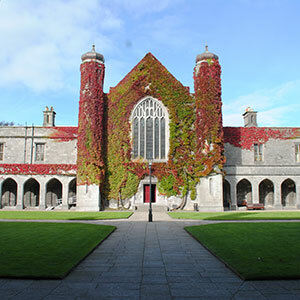 Emphasis is placed on internet and WiFi connectivity within the building, including various teleconferencing links to NUI Galway. 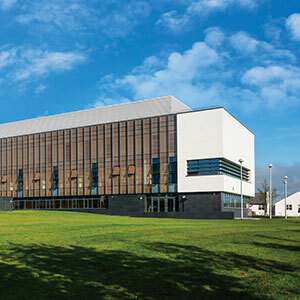 A lecture theatre, clinical skills space and student reading room comprise some of the many attractive features of the Donegal Medical Academy. Students will have 24-hour access to facilities on the ground floor, enabling easy transfer from the hospital to a more personal learning environment. Sheol an tAire Sláinte, Simon Harris TD Acadamh Leighis Dhún na nGall go hoifigiúil inniu (12 Nollaig 2016). Comhfhiontar atá ann idir OÉ Gaillimh, Grúpa Cúraim Sláinte Ollscoile Saolta agus Otharlann Leitir Ceanainn le dochtúirí a thraenáil. Tá an tAcadamh Leighis lonnaithe in ionad a tógadh go speisialta dó ar thailte Otharlann Ollscoile Leitir Ceanainn. Leis seo tá infheistíocht mhór á déanamh ag OÉ Gaillimh in oiliúint chliniciúil i gCo. Dhún na nGall. Seo an ceann deiridh de shraith acadamh leighis atá bunaithe san Iarthar agus san Iarthuaisceart. Tógadh ionaid den chineál chéanna ag Otharlanna Ollscoile Shligigh agus Mhaigh Eo agus osclaíodh iad sin anuraidh. Tabharfaidh Acadamh Leighis úr Dhún na nGall deis do dhochtúirí na todhchaí a gcuid scileanna cliniciúla a thabhairt chun foirfeachta i ngach aon réimse speisialtóireachta leighis faoi shúil ghéar teagascóirí agus léachtóirí. Caitheann suas le 60 mac léinn ón 3ú bliain, ón 4ú bliain agus ón bhliain deiridh sa leigheas seal in Otharlann Leitir Ceanainn gach aon seimeastar le dul faoi oiliúint chliniciúil. Lonnaíodh an tAcadamh Leighis ar an suíomh chéanna a bhfuil an otharlann air d’aon turas le deis a thabhairt do mhic léinn oiliúint theagascach a fháil san Acadamh agus oiliúint cois leapa a fháil san otharlann. Tá an cóimheas íseal idir teagascóirí agus mic léinn agus fosta idir mic léinn agus othair ar cheann de na buanna atá ag acadaimh leighis OÉ Gaillimh. In Otharlann Leitir Ceanainn faigheann mic léinn taithí chliniciúil agus déantar iad a stiúradh i réimse leathan disciplíní sa leigheas ginearálta, sa mháinliacht chliniciúil agus i bhforéimsí speisialtóireachta. Ó mhí Eanáir 2016, tá Acadamh Leighis Dhún na nGall ag cur fáilte roimh mhic léinn ar chlár nua Intéirneachta Sóisearaí na Scoile a bhíonn ag díriú ar dhaoine a réiteach don chleachtas cliniciúil agus don ghairmiúlacht. Tá clár meantóireachta d’intéirnigh ina chuid den chlár sin chomh maith. Bíonn Scoil an Leighis ag iarraidh a cuid céimithe a fhorbairt le go mbainfidh siad barr feabhais amach mar intéirnigh agus sa chleachtas cliniciúil. Tugann sí deis dóibh na scileanna cuí a shealbhú chun go mbeidh siad ina gcliniceoirí, ina n-acadúlaithe, ina gceannairí agus ina n-oideachasóirí inniúla i dtimpeallacht oibre atá casta agus éilitheach. Beidh mic léinn sa bhliain deiridh ag obair ar fhoireann chliniciúil ar na bardaí ó mhí Eanáir ar aghaidh. Beidh siad ag feidhmiú mar intéirnigh sóisearacha, agus beidh lántacaíocht acu. Beidh siad ag fáil taithí ar a bheith ag obair ar fhoireann agus ar chinntí a dhéanamh. Beidh dochtúirí comhairleacha ag obair i ndlúthchomhar le hintéirnigh chun go gcuirfidh siad eolas ar an timpeallacht chliniciúil agus chun an t-aistriú ón mac léinn chuig an dochtúir sóisearach a éascú. Is clár cúig nó sé bliana atá sa churaclam leighis in OÉ Gaillimh agus bíonn thart ar 180 mac léinn ar an chúrsa gach aon bhliain. Is curaclam nuálaíoch é ina ndéantar na heolaíochtaí cliniciúla a nascadh leis na heolaíochtaí beatha. Cinntíonn sé go mbíonn na mic léinn ag plé le hothair go luath agus go dtumtar iad i dtimpeallachtaí cliniciúla éagsúla. Ón bhliain acadúil 2015/16 ar aghaidh, beifear ag cur níos mó béime ar intéirnigh a ullmhú le bheith réidh le tosú ag obair. Bhí an méid seo a leanas le rá ag an Uasal Muyiwa Aremu, Déan an Oideachais Leighis i nDún na nGall faoin togra: Tá Acadamh Leighis Dhún na nGall i ndiaidh tús a chur le forbairt an oideachais leighis fochéime in Otharlann Leitir Ceanainn agus i measc phobal an Chontae. Bhí fiche mac léinn a bhí sa 3ú bliain den chúrsa leighis san Acadamh nuair a cuireadh tús leis in 2011. Tá seasca mac léinn ag freastal air anois ón 3ú bliain, ón 4ú bliain agus ón bhliain deiridh. Tosaíodh ag tógáil an ionaid nua-aimseartha seo i mí Eanáir 2015. Tá saotharlann scileanna cliniciúla, léachtlann mhór agus seomraí teagaisc do ghrúpaí beaga ann. Tríd an togra seo, tá infheistíocht ollmhór á déanamh ag OÉ Gaillimh in oideachas leighis in Otharlann Leitir Ceanainn agus i gContae Dhún na Gall uilig. Tá oiliúint leighis ar chaighdeán ard iontach tábhachtach má táimid ag iarraidh go dtabharfar aire den scoth do na hothair, agus sin go díreach an rud atá á chur ar fáil ag Acadamh Leighis Dhún na nGall i gcomhar le OÉ Gaillimh, íoclanna dochtúirí teaghlaigh i gContae Dhún na nGall agus Otharlann Leitir Ceanainn. Tá Acadamh Leighis Dhún na nGall lonnaithe ar thailte Otharlann Leitir Ceanainn. Is cuid den Otharlann mar a bhí an foirgneamh, cé go n-aithneofá gur síneadh breise atá ann, agus socraíodh ar bhonn straitéiseach é a lonnú in aice leis an phríomhbhealach isteach chuig an champas cúraim sláinte. Ionad ilchuspóra teagaisc, staidéir agus foghlama atá san fhoirgneamh. Ó tharla go bhfuil an tAcadamh lonnaithe ar shuíomh na hOtharlainne beidh mic léinn ábalta freastal ar ranganna teagaisc san Acadamh agus ar theagasc cois leapa san otharlann. Is i gcomhar le Feidhmeannacht na Seirbhísí Sláinte a cuireadh an togra seo i gcrích. Cuireadh tús leis an togra i mí an Mhárta 2015 agus bhí sé réidh i mí Eanáir 2016. An comhlacht ailtireachta Rhatigan Architects i Sligeach a dhear an foirgneamh agus an comhlacht tógála áitiúil Boyle Construction a thóg é. Rinne OÉ Gaillimh infheistíocht de thart ar €2.0 milliún sa togra seo. Infheistíocht shuntasach san oiliúint chliniciúil atá ann. Rinne Feidhmeannacht na Seirbhíse Sláinte maoiniú chomh maith ar an dara hurlár den fhoirgneamh. Déanfar an chuid seo a fheistiú amach anseo agus is ann a bheidh na háiseanna úra Scagdhealaithe Duán lonnaithe. Tá dearadh ailtireachta nuálaíoch ar an fhoirgneamh ar fad. Tá an foirgneamh deartha sa dóigh go mbeidh cur chuige solúbtha ann maidir leis an teagasc. Tá na spásanna difriúla san fhoirgneamh deartha sa dóigh go mbeifear ábalta freastal ar ghrúpaí difriúla mac léinn, idir bheag agus mhór, ag an am céanna. Tá béim ar cheangal idirlín agus ar cheangal Wi-Fi agus ar naisc físchomhdhála le OÉ Gaillimh san fhoirgneamh. Tá léachtlann, spás faoi choinne scileanna cliniciúla agus seomra léitheoireachta do mhic léinn ar chuid de na háiseanna tarraingteacha eile atá san Acadamh Leighis. Beidh teacht ag na mic léinn ar na háiseanna thíos staighre de ló agus d’oíche, agus tabharfaidh sin deis dóibh a bheith isteach agus amach as an otharlann le staidéar pearsanta a dhéanamh.